Motion-activated night lights trigger an LED light when movement is detected (Source). They'll either be plug-in night-lights (like the GE Ultra Brite), or wireless night-lights that are battery-powered (like the ﻿﻿Wislight) that provide automatic night-lighting. They're great to illuminate dark areas of the home at night- ensuring that you, your kids, house-guests, the elderly and even pets, can safely travel throughout the interior of your residence in the evening (Source). They include integrated light sensors so that they aren't triggered unless it's dark (Source). You can install them in outdoor areas as long as they are properly sheltered from harsh weather (think, garages & carports) (Source). All of these motion-sensor night lights plug into outlets, except the battery-powered, wireless Wislight, which can be mounted anywhere in your home. As well, all of these lights will turn on when they detect motion, but the Sensky night-light is a little bit different. It has 2 light strips- the front light is always on when it's dark, while its back-light is only triggered by motion. ​The AmerTac night-light and General Electric Ultra Brite have the greatest detection ranges at 25 ft. The GE Ultra Brite features a motion-activated LED light that is automatically triggered up to 25 feet away, turning off after 90 seconds if there's no more activity. It includes a 40-lumen LED light that doesn't emit heat, remaining cool to the touch, only turning on in low-light scenarios. This motion-activated night-light offered by AmerTac is a good option for someone who needs a decorative night-light with a sensor. Users love the functionality of this night-light, but some do complain about the sensitivity to motion and the range of the motion detection. This product detects motion up to 25 feet within a 100-degree-wide zone and turns on automatically. It features an auto-off option after 60 seconds. The light sensor prevents the light from turning on during daylight hours. It can be plugged into any standard outlet. This product seems like a good choice for someone who needs an inexpensive motion-activated night-light. The general user consensus concerning the AmerTac motion-activated night-light is that is functional and perfect for a bathroom at night. One satisfied user says that it has a soft warm color that provides good light at night. However, some buyers complain about the sensitivity to motion of the sensor. Some complain that the item is extremely sensitive which causes the light to turn on often even if you are just passing it by. On the other hand, some users complain that the range of motion detection is far less than advertised 25 feet. 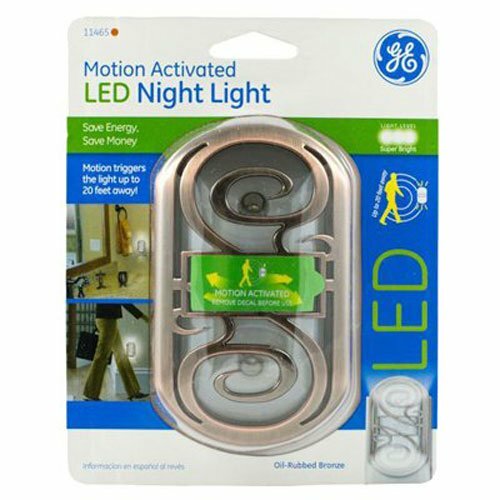 This motion-activated night-light offered by GE is a good option for someone who needs a bright, long-life LED night-light.Users love the efficacy of this night-light, but some do complain about the side vision and occasional flickering. This product turns on automatically when motion is sensed, up to 25 feet away, and turns off after 90 seconds of no activity. It features 40-lumen, long-life LED bulbs that stay white and bright, while always being cool to the touch. This light is intended for indoor use and will only operate in low-light conditions. It comes in 4 colors: bronze, brushed nickel, silver and white. If you are looking for a bright night-light, this might be a good option. In general, users have a favorable opinion of this GE motion-sensing night-light, saying that it is a great light which works well and looks good. One happy purchaser says that it is very useful in the bathroom at night. Another reviewer states that it turns on from at least 15 feet away. However, some buyers complain about poor side vision saying that you need to be almost right in front of it to trigger the sensor. Another complaint is that the sensor can easily be confused and thus spontaneously turn on and off. This motion-sensor night-light offered by WISLIGHT is a good option for those who need a wireless motion-activated night-light. Users love the functionality of this night-light and have only minor complaints regarding some design flaws. This product has10 feet sensing range, and it turns on when the motion PIR sensor is activated and keeps 30 seconds before turning off. It works on batteries and it comes with 3M tapes and screws for easy installation. If you are looking for an elegant battery-operated night-light, this might be a good option. In general, users have a very favorable opinion of this motion-activated night-light and they state that it is very functional, attractive and offered for a reasonable price. One happy purchaser shares that stickers are strong enough to hold the device and they don’t pull paint from the wall when the light is removed. Some users wish the light was a little brighter and didn’t stick out from the wall as much as it does, but don’t find this to be a deal breaker. If you are looking for a top-rated motion-activated night-light, you might want to consider this motion sensor light offered by Sensky. Users like its functionality, but some do complain about the misleading description of the two-mode feature. This product features a motion sensor which turns the light on when you walk in the sensing range. It also has a light sensor that prevents the light from turning on during daylight hours. It features a fire-proof material which makes it safe and reliable. This motion-activated LED night-light could be a good choice if you are looking for a two-mode motion-sensing light. In general, buyers are satisfied with the performance of this motion-activated night light. One satisfied user says that it emits nice warm light. Another one shares that she likes the two-mode functionality since the product gives nice glow when not motion triggered and bright enough light when it is triggered. However, several buyers complain about the misleading description of the item. They share that the front light stays on the whole time when it’s dark and not only when it senses motion. Moreover, some users would prefer if there was an option for adjusting the sensitivity of brightness of the night light intensity. If you are looking for a motion-activated night-light, you might want to consider this one with oil-rubbed bronze finish offered by GE. Users love the effectiveness and good motion-sensitivity, but do complain about the light spectrum and brightness. This product turns on automatically on when motion is sensed, up to 20 feet away. After 90 seconds of activity, the night-light will go dark, which is great because this feature means energy saving. It is available in three colors and designs: bronze, chrome and nickel. If you are looking for a decorative motion-sensing night-light, this might be a good option. 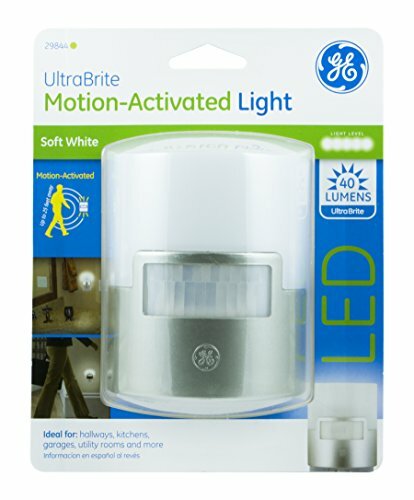 In general, users have a favorable opinion of this GE motion-activated night-light, and they praise its effectiveness and motion-sensitivity. One happy purchaser says that it consistently recognizes movement and turns off in a reasonable amount of time. He adds that it is attractive both lit and unlit. However, some buyers complain about the light spectrum of the LED light. One purchaser shares that the LED gives off a white light that lights up your floor with a spectrum that looks similar to office lighting. Another user states that the light is severe and the cover is clear so it isn’t pleasant when the light hits you in the eyes. The reviewer adds that the item is too bright for a night-light. The first motion activated night light we examined is manufactured by AmerTac. It is designed to be a helpful and decorative night light for hallways, bedrooms, bathrooms and any other interior space of your home that could stand some illumination. It's equipped to detect motion up to 25 feet away, including a 100° detection zone and an auto shut off after 60 seconds. An integrated light sensor ensures that it doesn't turn on during the day-saving energy. It's advertised as easily plugging into any standard outlet and since it's built from a LED bulb it doesn't emit any heat, making it especially safe for indoor home use. It's an attractive home-accent product that provides convenient illumination of dark areas- great for when guests in your home are taking a midnight stroll to the bathroom, or illuminating tricky staircase steps to make sure that you or a loved one doesn't take a dangerous fall. One homeowner told us that he has purchased several of these motion activated night lights, saying that if you are somewhat enterprising you can tape it over with colored scotch tape for a dimmer and different night light effect. Overall, buyers were impressed with its motion detection, its relative attractiveness and the fact that it is not overly bright and doesn't emit any heat. Another reviewer installed it in their bathroom, saying that because of a prostate issue he frequently has to use the restroom at night and prefers triggering the night light rather than turning on the fluorescence in the bathroom which disrupts his ability to get back to sleep. The second motion activated LED light we examined is the General Electric Ultra Brite. 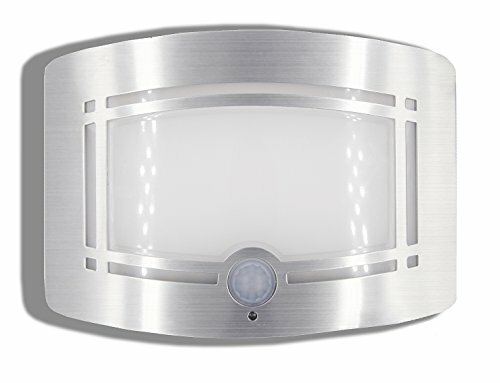 It comes in a couple different colors including bronze, brushed nickel, white and silver and is equipped to detect motion up to 25 feet away with a long-lasting LED. It's designed to be a cost saver- the automatic night light sensor ensures that it only goes on when needed, illuminating wasteful electricity usage with a 40-lumen bulb. Buyers say that it doesn't quite pick up 180° motion- with one reviewer saying that he installed it in his hallway and finds that the motion needs to be completely centered before the light will trigger. Buyers say that its ambient light sensor ensures that it doesn't turn on unless the room is dim or dark. Some enterprising buyers even used scraps of folded paper inserted into the device to help channel and direct the illumination to create a customized effect for their long hallway. The reviewer purchased a dozen of these motion activated light sensors saying that they perform an invaluable home-security service- ensuring that wherever you go in the home, a nightlight is tripped, which is a great way to deter home intruders, he thinks. The third night light sensor we examined is manufactured by Wislight. It features a 10 foot sensing range, automatic shut off during the day, and will stay on for 30 seconds after its activated. A battery operated unit, it ships with tapes and screws so that it can be wirelessly installed on walls. One reviewer purchased several of these wireless options to illuminate the dark hallway that leads to his bathroom, saying that it was a cheaper solution than hiring an electrician to install motion sensor light switches. Other buyers were fairly impressed, as well, saying that they appreciated its brightness adjustability and the safety benefits it provides for elderly relatives, wandering pets, children and even the disabled- functioning as a component of a robust home fall prevention and safety protocol. 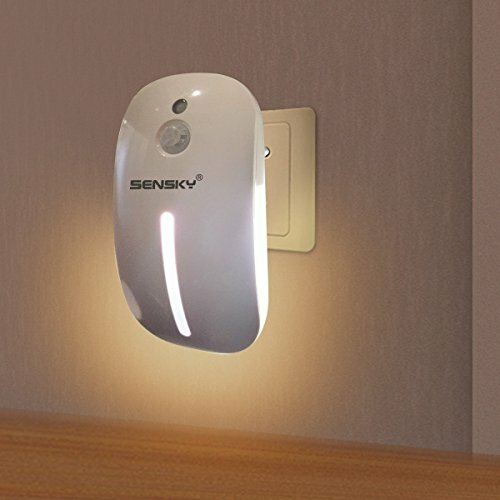 The fourth plug-in motion sensor light we examined is manufactured by Sensky. It features a light sensor so that it doesn't get triggered during the day and you can set it up to work either automatically or manually. 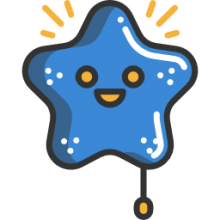 It's marketed to be used in a variety of different locations, including dark stairwells, unlit kitchen areas, inside nurseries, laundry rooms, and hallways. It's made for 110 V outlets with an AC US style flat-bladed plug. This auto nightlight is a little bit different- the front light strip stays on all the time at night while the backlight comes on when it is triggered by motion. Reviewers say that it has been an ideal solution for low vision scenarios, helping you ensure that you don't trip over pets when stumbling to the bathroom at night, and illuminating the painful and harsh glare of bathroom lights that can harm your ability to return to deep sleep. 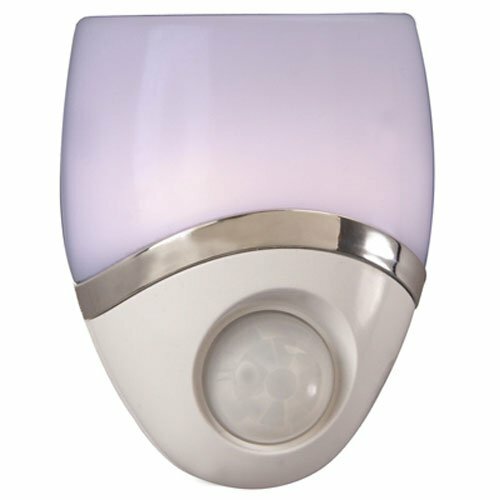 The last motion activated night light we examined is another General Electric product- it can detect motion from up to 20 feet away and ships in three different colors- nickel, chrome and bronze for a decorative effect. Buyers say that it provides a bright white light and is only triggered when motion is detected, remaining on for about 30 seconds. Some buyers thought that it was a little bit too bright and recommended the manufacturer modify it so that the light diffuses more so that it would be less harsh. Other homeowners were unimpressed, saying that the light wore out in under a year. They blamed it on a faulty light sensor as it's unlikely a LED light would break down in such a short amount of time. Another reviewer brought up an interesting point, telling us that during powerline surges these lights can be destroyed. While not an outdoor option, you can install them in an outdoor garage or carport as long as they are adequately shielded from the elements.